“Many young people do not have the financial and family support network to reach their full potential and need a helping hand”. We recently interviewed Rosa Velkovski, who was one of 16 hikers to take on last year’s Blue Mountains Hiking Challenge. Rosa’s employer, MLC, was Gold Sponsor of the 2018 Wheel Classic and Hiking Challenges. Rosa said that prior to undertaking the hike, she hadn’t had much experience with this sort of physical challenge, but the support of her fellow hikers, a good pair of walking boots and lots of sugar and Gatorade got her through the 45km trek. Register and start your training for the 2019 Hiking Challenge today. 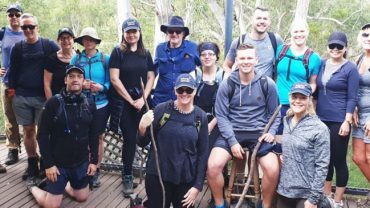 This year, our hikers will tackle the ancient and magnificent terrain of the Grampians National Park over four days with optional additional activities such as mountain biking or kayaking.